For over 40 years, Rotomod has designed and produced canoes and kayaks in France. These kayaks and sit-ontops can be found all over the world floating down rivers, catching waves and taking anglers to the fish. 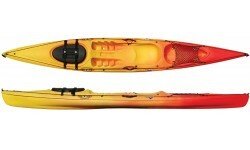 Brighton Canoes is pleased to offer the full range of RTM Sit-on-tops and fishing kayaks. Looking for an RTM model not listed? Just give us a call on 01273 513200 for prices and availability. The RTM Abaco 4.20 Luxe is a fully loaded fishing Sit on Top kayak designed by a fishing guide and an aquatic engineer for paddling performance and ease of use when at the fishing grounds.